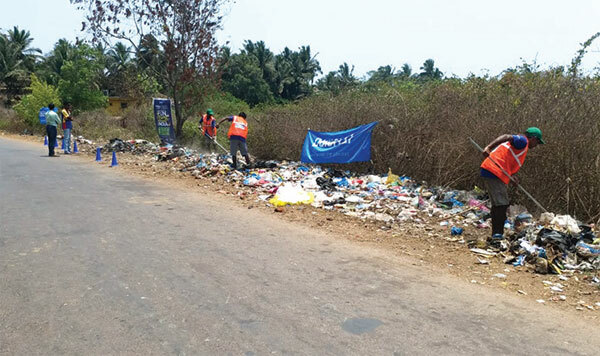 initiative in riding public space of its garbage has hit the shores of Goa. After a joint initiative between Drishti Lifesaving Pvt ltd and a radio station, where listeners could report about garbage and litter and the Beach cleaning services would move in to clean area, the initiative is being carried forward by Herald, in its Cafe section. Drishti meanwhile got additional workers to act on citizen’s pictures, texts and information to rush to the spots to clean them and meet the #Trashtag challenge. Bambolim was the first place to be covered with 1.5tons of garbage. In another 4 days 2.5 tons of garbage was collected by covering the major areas like Old Goa, Dona Paul, Caranzalem and Bambolim. The garbage is segregated by the Drishti team and then taken to the Saligao waste garbage plant. This challenge which started on April 19 will wind up with the Blockbuster Garbage Cleaning where only the Drishti hands won’t be enough. “The only worry is, after cleaning people should not litter the place again because on the first day in Bambolim after cleaning again there was litter the next day. When there are advantages like this we need to maintain the surroundings,” says Reo Raymond, a Radio Jockey. It surely does, and Herald will now be a platform to link your efforts to cleaner solutions. • Hashtag trends are known to be fun and trendy and meant to entertain everyone. • The hashtag #Trashtag blew up on social media when a Reddit user posted a screenshot of a person completing the challenge. • In this challenge people post pictures of before-after pictures of them cleaning any specific place. • The challenge has been taken up by people across countries and goes by different names including #CleanUpChallenge, #trashchallenge and #ChallengeforChange. • The viral #Trashtag Challenge thus encourages people to clean up litter in their local communities.